We love to photograph outdoor weddings! Even if the ceremony and reception are inside, we will always try to shoot some portraits outdoors in nature. Especially for destination weddings, including the beauty of the location in the photos is so important. Equally important is the experience of getting outside - couples often tell us their portrait session is their favorite time during the wedding because they get away from all the excitement and energy and get to have some peaceful time alone together to talk and to enjoy nature! 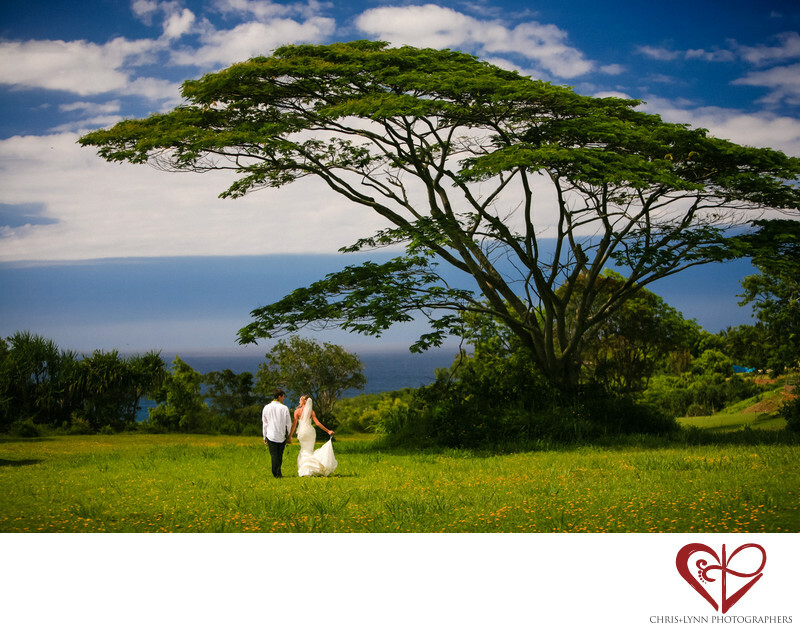 For this image, we wanted to showcase the location's distinctive elements: the flat-topped Moluccan Albizia tree, also known as the "miracle tree" and the expansive views of the ocean and sky on this Hawaiian island paradise. Against this green and blue backdrop, the couple themselves pop! We asked the bride to hold up the bottom of her dress both to make it easier for her walk on the grass and to accentuate her tiny waist! I love the relaxed ambience of this image as husband and wife move forward together. A circular polarizer was used to enhance the blues & greens of this image - no photoshop was required to create the saturated colors of this destination wedding image!